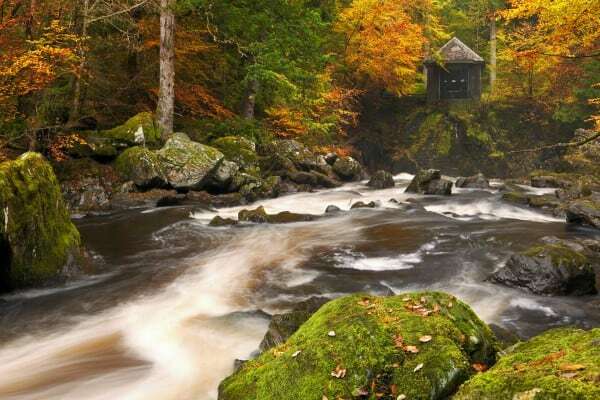 Pitlochry Places to visit : A visit to Dunkeld, whilst on a break at Rosemount Hotel Pitlochry, is an endearing experience with something for all. The town centre is neat and compact with delightful tearooms, independent shops and galleries. The bridge over the Tay is exceptionally photogenic and a walk along the river banks and up into the hills on either side of the river is highly recommended. A helpful tourist map-sign at the bridge gives plenty of material to follow, but the following publication, The Dunkeld Paths Leaflet, is also extremely informative and useful. It may be downloaded from here. For music -lovers, at the Taybank Hotel, there are regular live sessions and live bands performing throughout the season. A great location packed with atmosphere. Also, of huge musical stature, the area is home to Perthshire’s Dougie Mclean, of “Caledonia” and “Perthshire Amber” fame. Dougie has been known to hush a stadium of people, standing alone with acoustic guitar and mic. That is powerful! See our facebook page for a fabulous video recording of Dougie McLean’s “Caledonia”.